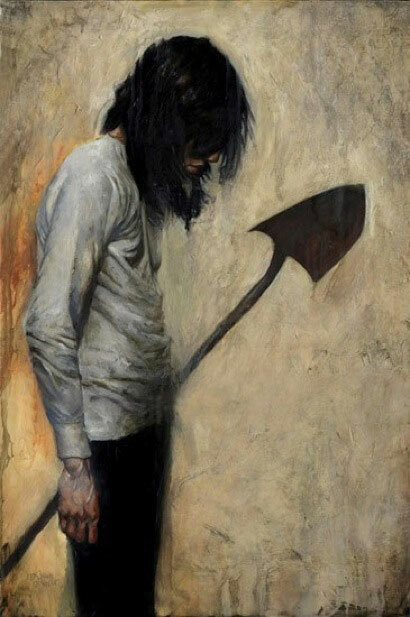 Jason Shawn Alexander’s figurative work is simply amazing. It’s so good I almost want to give up painting myself. I won’t, but I may take the weekend off. This entry was posted on Friday, June 20th, 2008 at 8:20 am	and is filed under Oils. You can follow any responses to this entry through the RSS 2.0 feed. You can leave a response, or trackback from your own site. What is this guy planning to do?! Love the piece of art though, looks great, but rather scary!! I love the work of Jason, its simply Amazing, sometimes he remenber me the work of a Portuguese painter, Paula Rego (i dont like so much of her paints), but in my opinion Jason works is better, and that dark side that we can see in the paints is wonderfull.